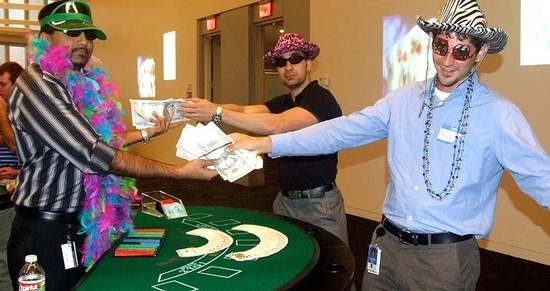 With friendly professional dealers, regulation sized casino tables, and professional accessories, Best Houston Casino Parties creates authentic Las Vegas night atmosphere for your guests. Our inventory of casino tables include but are not limited to Roulette, Blackjack, Texas Hold-em, Pai Gow, Money Wheel, and Professional Craps. For answers to your questions, visit our Frequently Asked Questions page, or contact us for more information. A voucher will be provided to each of your guests in the beginning of your event to be exchanged with the dealers for real casino chips which are used as play money. Your guests attempt to gain as many chips as possible for a chance to win a prize at the end of the event. The prize that you provide is always a great way to motivate your guests to really try to collect as much as they can. At the conclusion of your casino party, you have the choice of a Casino Raffle or Casino High Tally. A raffle will allow for all your quests the chance to win that special prize. Fifteen minutes prior to your ending time, your guests will cash in their casino chips in exchange for raffle tickets (1 ticket per every 100 points, max 20 tickets). Your casino manager will make sure that all the raffle tickets are in the drum, then a winner is picked for each number of prizes. A high tally will allow for the top 3 players to get prizes, 1st, 2nd, and 3rd. 15 minutes prior to your ending time, your guests will turn in all their chips as the dealer counts and adds up your winnings. On the back of the play script is a section to put the players name and total winnings. The Pit Boss will gather the high tally cards and find the top 3 winning amounts, 1st, 2nd, and 3rd. Your casino manager will make all announcements on who the big winners are. Best Houston Casino Parties will provide you with professional dealers and a Casino Manager (Pit Boss) dressed appropriately for your event. All our dealers have personalities to make the evening as enjoyable as possible and will gladly explain the simple rules of the games to your guest. We will gladly dress for themed casino parties with Hawaiian wear, sports wear, team wear or simple casual wear. Call our casino rental company in Houston, Texas, at (713) 541-1000 for more information about our casino parties and tables.